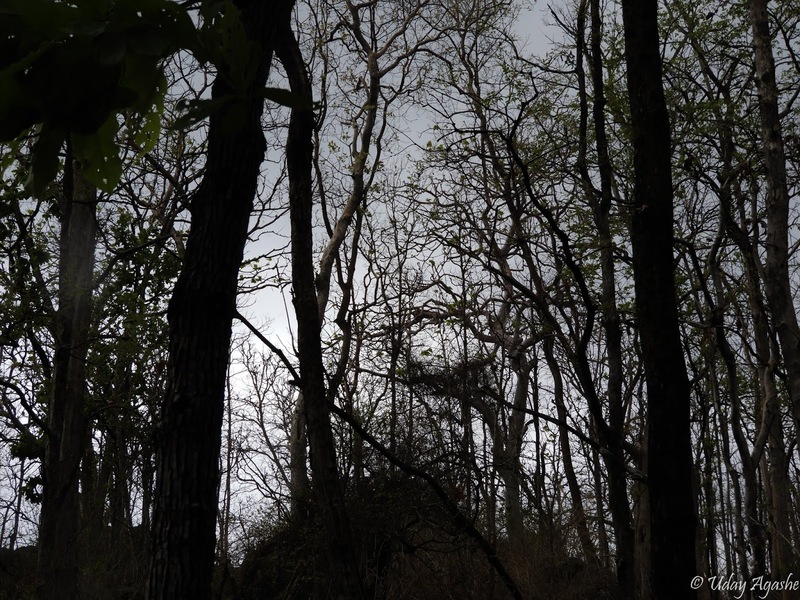 This narrative is about my recent tour to the Pench National Park on the Maharashtra/MP border. Just a week before this tour I had been to the Ranthabore national park and sighting of a tiger was a very common occurrence there. Coming to Pench things were little different and additionally it rained in Pench a day before we arrived (and it continued to rain on all 3 evenings while we were there, to the point that on day 2, I just couldn’t take my camera out for any photograph). 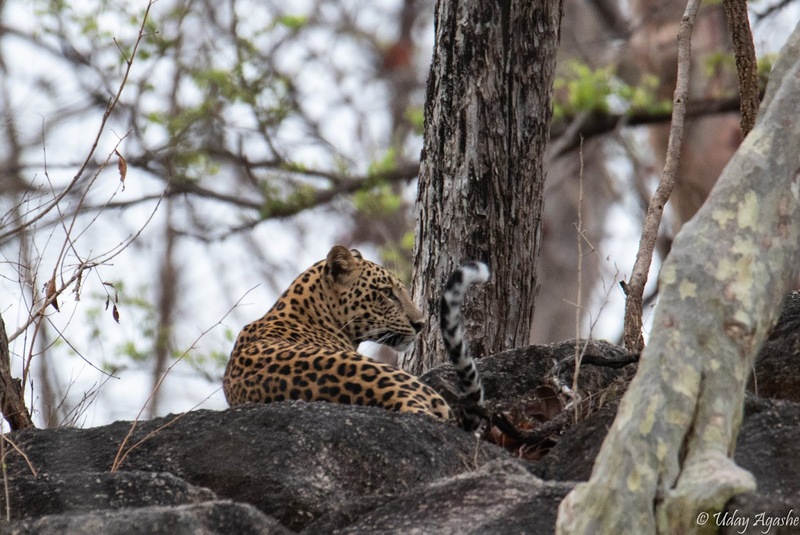 But the rain (and the cooler weather that it brought along) meant possibility of sighting a leopard increased (obviously this came from the experts on the tour – Abhay Kewat/ Dnyaneshwar Katkade). There were lot of learnings here. The way the monkeys respond to a tiger is different than how they respond to a leopard. The experts can easily make it out. With tiger, it seems they give a loud shout and move away but in case of leopard, they will make smaller but continuous noises and will try to crowd around the location where the leopard is seen, they will be relentless till they see the danger moving out of their area. Knowing it is one thing but actually seeing it in the jungle is completely different, and that has to be experienced. No substitute for that! These are some of the images in the morning. 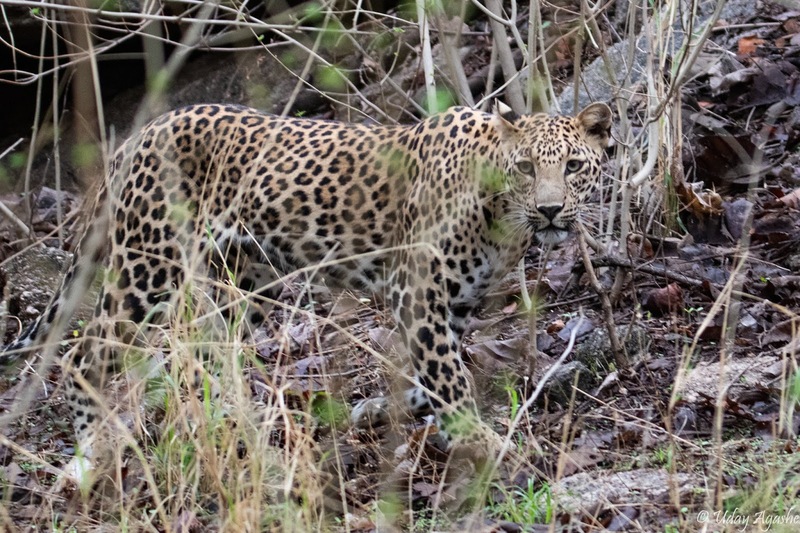 As can be seen in the last picture, the leopard went towards the rocks and from there it disappeared. When we started our evening safari, we thought it would be good idea to check if we can spot it again. 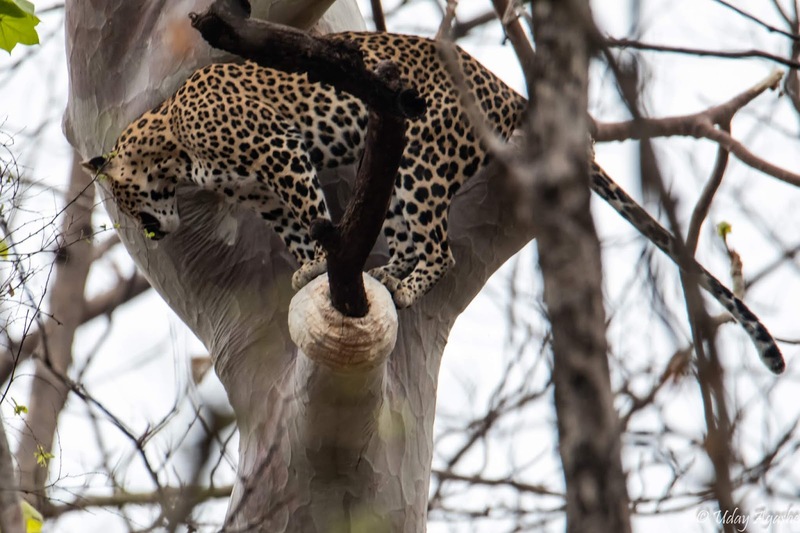 It was possible that the leopard remained in that vicinity but possibly hiding away on a tree. There I got to learn some more things about the jungle. The leopards are normally scared of 2 other animals. One is obviously the tiger and the second is “wild dogs”. Yes, you read it correctly. Wild Dogs always move in packs and can be very dangerous even for a tiger. They don’t bother about their own life but just attack. It seems there were instances in the past (in Pench itself), where a male tiger was attacked by 7-8 wild dogs and there was a real fight. The tiger finally could save himself only by running away from them and ran about 3-4 kms at his best speed. 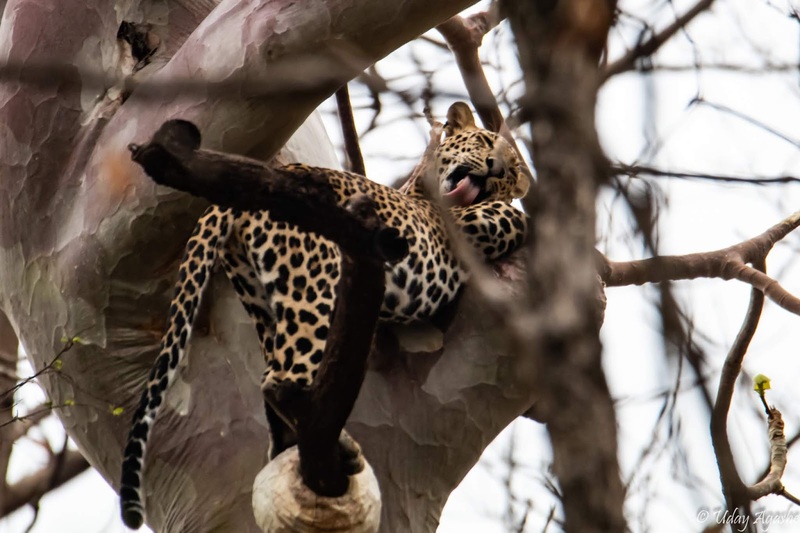 So the easiest way for the leopard to remain safe is to climb a tree and rest on the branches. Abhay and the local guide were on the look-out for the signs. There were no alarm calls (neither from monkeys nor from the deer) to help. Abhay told us to keep a close look in addition to his own vigil. I knew that the leopard could climb a tree and thought it must one of those big trees which can easily take its weight. We all were looking for it. Vishwam even saw some pug-marks on the way (much earlier than where we had last seen the leopard though). The rain possibility was looming large and it was getting dark. At 4:30pm, the light was like 7pm. 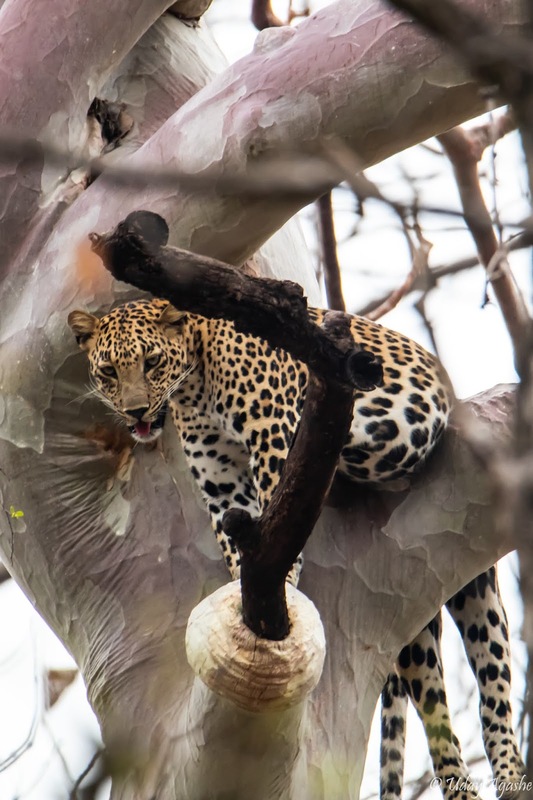 That’s when Vishwam alerted to a possible leopard on a tree. How on earth did he even identify it from a moving jeep, was a puzzle to me (and I am sure even for the others, including our guide). Just to give some idea, here is a picture of the area where he sighted the leopard. May be some of you could find its position by zooming-in on the picture but we had no opportunity to do that in real life. And on top of that, we were in a moving gypsy, making it even more difficult. “थोडा आगे” ... “थोडा पीछे” .. “जरासा right or left”, we just kept on instructing with desperation to get the right angle. And no one was fully satisfied with any position. Luckily ours was the only gypsy that sighted it, so we could keep moving relatively easily. Even after stopping at one place, the gypsy was shaking when anyone made even slightest movement (and all of us were always moving - adjusting our position, adjusting the bean-bags for support, adjusting cameras, and so on). Best part is, in all this melee, we could actually take some meaningful snaps.